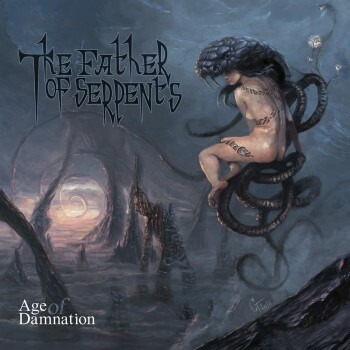 Совместный релиз Satanath Records и United By Chaos: новый альбом "Age Of Damnation" сербской gothic doom metal группы The Father Of Serpents выходит 19 июня! / Co-release Satanath Records with United By Chaos: new album "Age Of Damnation" of Serbian gothic doom metal band The Father Of Serpents out on June 19th, 2017! The Father Of Serpents is an entity consisted of six souls, entwined with admiration for doom metal. Formed in 2015, by the members of the renown bands from the Serbian scene (The Hell/Awaiting Fear, Tamerlan, Rain Delay, Consecration), their purpose was to leave their name within the musical path paved by the old masters like My Dying Bride, Saturnus, Paradise Lost and Moonspell. Due to their professional approach and reputation beforehand, The Father Of Serpents quickly got large amount of attention in Serbia and beyond. Band performed in Serbia, Bulgaria, and Romania, supporting such names like Fear Factory, Attic, Mourning Beloveth, Caronte, Eye Of Solitude, and many more. First album "Age Of Damnation" contains about an hour of apocalyptic atmosphere, presented through the gentlest of acoustic passages, to the most brutal and vicious parts. The album is consisted of ten tales of struggles against the very real monstrosities this world has created, as well as the parts of ourselves, that such monstrosities have infected. These are the tales of spiritual survival, battles, wars, kicking, tearing, and biting in order to preserve at least some sanity, in the world, which has doomed us all to slavery, and connected us to a single mind-machine, in order to harvest us for any drop of quality, that we, as individuals, have.